It may seem like choosing your grout color isn’t as important as choosing your tile, but the truth is that grout plays a big role in your tile’s overall look. You might have found the perfect tile for your flooring or backsplash project, but don’t overlook your choice of grout color. Grout is the material in between tiles. It helps lock your tiles in place, prevent tile edges from chipping or cracking, and gives your tile floors and walls a smooth, finished look. Depending on your color choice, grout can visually blend, compliment, or contrast with your tile. Grout has the power to completely transform the look of your room, from clean and modern to dramatic and eclectic. Are you using ceramic tile, porcelain, glass, or something else? Is it solid colored, or does it mimic natural stone? Most tile is made from natural materials, which can feature color and pattern variations. These differences can be subtle or more stark, depending on the tile you’ve chosen and the look that you want. Grout can minimize contrasts or accent them. Next, think about the room that you are redoing. Are you tiling your entryway floor? Your kitchen backsplash? Your master bathroom? Where the tile is going (and your style preferences) should factor into your grout color choice. Areas that get dirty quickly—like kitchens or entryways—may look better over time if you choose a darker-colored grout. White grout, while pristine and beautiful in photos, stains easily and requires more close care. Grout that matches your tile will blend almost seamlessly with the tile, creating a clean, uninterrupted look. For example, if you are going for a minimalist aesthetic, pick glazed white subway tile and white grout for an on-trend look. Soft neutrals like light grey or warm white compliment many colors and varieties of tile. Safe colors are a great choice when you want to make your tile the focal point. A neutral that is just a couple of shades off from the color of your tile will balance your space, as well as camouflage any stains. If you don’t want to make a statement with your tile installation, complimentary grout will always be in style. Choose contrasting grout if you want to create a geometric focal point. Dark grout with light tile (or the reverse) will highlight the graphic nature of your floors. To enhance the statement, consider laying your tile in a pattern such as herringbone. Tiles that aren’t square, rectangular, or made in traditional shapes sometimes require more thought when picking a grout color. 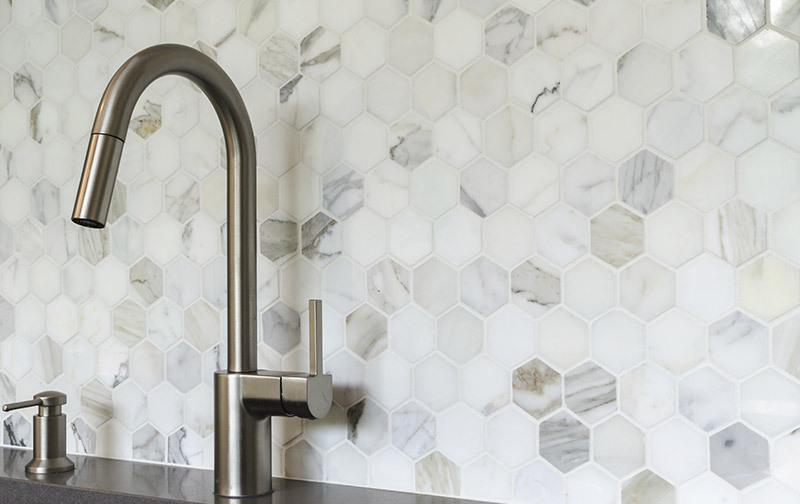 Non-traditional shapes like scallops and hexagons provide a great opportunity to experiment with contrasting grout to create a more modern look. Wood-look porcelain tile is increasingly popular with homeowners, and when it comes to grout, it’s unique. The space between the tiles is typically more narrow, but your chosen grout color will still affect your flooring’s overall look. If you’ve selected wood-look tile for your home because you want it to mimic the look of natural hardwood, choose a darker grout color that will blend in with the darkest hues in your tile. Going with the darkest shade for your grout will minimize its visual draw and give your floors a more cohesive and wood-like finished look. Natural pebble tiles and penny tiles are round in shape, meaning that there is more grout visible between each tile. This makes the grout used for these types of tiles stand out more, making it more challenging to choose a color that compliments your space well. Round tiles are known to make your make grout appear bolder than you might expect. Opting for a grout color that’s very similar to the color of your tile is a safe choice for beautiful floors. Not sure what grout color to choose? Ask your installer to prepare a few small samples of your tile with the grout colors you are considering. Often, installers can install a small sample of your tile on a piece of plywood and apply different colors of grout to give you an idea of what your finished floors might look like. Take your samples into the room where your new tile will be and live with it for a few days. Take note of other design elements and colors (as well as the lighting in the room) to help you decide which grout color will work best. Your flooring installer can also help you choose the right type of grout for your project, and they can recommend sealing methods, too. Sealing your grout will help it continue to look beautiful for a long time to come and make maintenance easier.